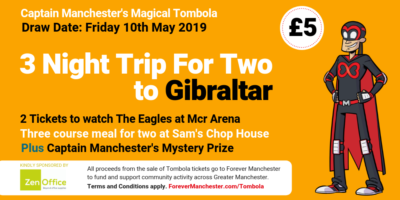 The fresh eastern Restaurant Tampopo is showing their support for Forever Manchester Week. Tampopo is named after a Japanese film telling the story of a woman trying to find the perfect bowl of noodles. That’s a quest that Tampopo take on every day. If you go to one of the city-centre restaurants during Forever Manchester Week – you’ll be asked whether you would like to donate £1 to us. We’d love it if you say yes! We are delighted to have the support of such a fantastic restaurant that helps nourish our fellow Mancunians (adopted or otherwise). For the full list of Forever Manchester Week events, as well as food and drinks offers, go to forevermanchesterweek.com.